I went to Cirebon last month. Located in West Java, Cirebon known as the shrimp city but I knew nothing about Cirebon as the shrimp city. Well, I’m going to begin my blog with the most attracted experience while traveling to Cirebon. Me and my friend went to Kampung Batik Trusmi (Batik Trusmi Village) which located in Plered, Cirebon, West Java. Five kilometers to western Cirebon, Trusmi is such a heaven for batik lovers. All you can do there is not only shopping but also learning how to make batik to the craftmen. “Kampung Batik Trusmi” is indeed one of the most well-known batik brand in Indonesia. It is located in Plered subdistrict, some four kilometers away to the west of downtown Cirebon. A huge billboard with the word “Trusmi” can be clearly seen if you arrive in Cirebon through the Palimanan-Kanci toll road. Cirebon Batik may be as globally renowned as batik from Yogyakarta and Surakarta. But the batik designs of Cirebon has its own unique charm. It usually categorized as batik pesisiran (coastal batik), due to the city’s geographic location, Cirebon batik is sometimes also called Trusmi batik, after the city’s largest batik industry. 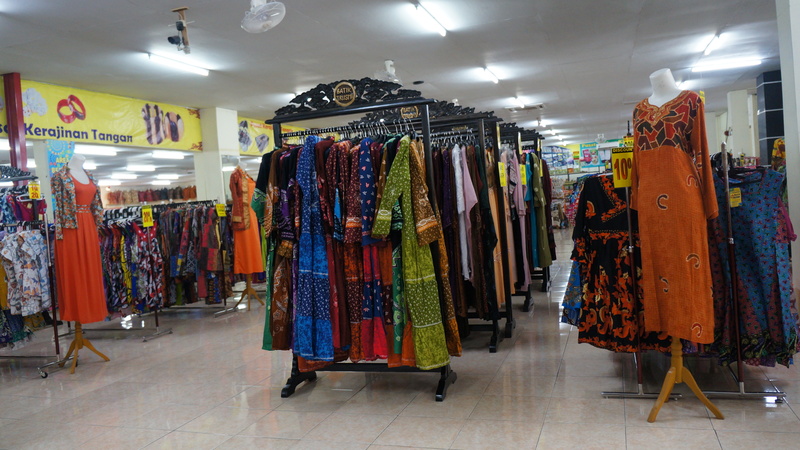 As a perfect place for batik hunting, right from the moment you set your foot into the Trusmi area, you will see that it is a perfect place for a batik hunting and shopping spree. 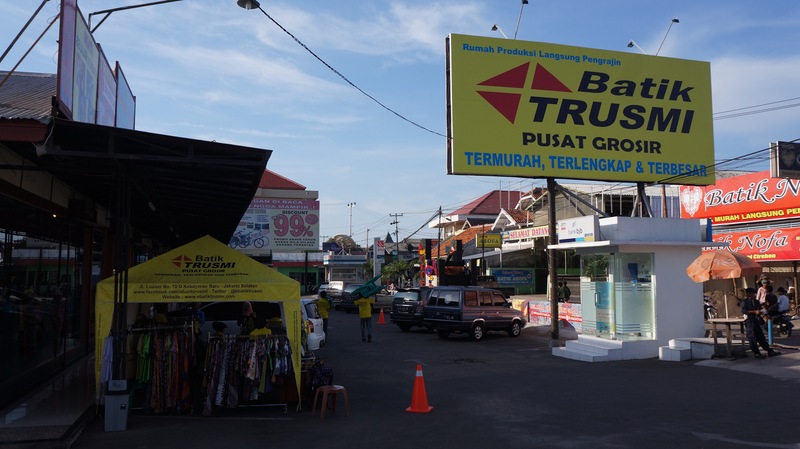 There are virtually batik stores upon batik stores lining up on both sides of Trusmi’s main road, Jl. Trusmi Kulon. In these comfortable shops, you can lose yourself for hours in the wonderful land of batik shirts, dresses, fabrics, and accesories. The batik sellers of Trusmi sell their batik fabric in varying prices, depending on the fabrics’ quality and how detailed the motifs are. You might be shock knowing you found a good quality batik fabric is sold at Rp 35,000 (US$3.5) while Rp 10,000 (US$1) will get you a key chain. Like many other batik-producing cities in Java, Cirebon has its own unique batik design, which is called the mega mendung motif. The motif looks like rain clouds and is usually painted in striking colors. It is heavily influenced by Chinese cultures, brought into the city by Chinese traders centuries ago. As I traveled around Cirebon, I know that the mega mendung batik fabrics are still worn by members of the Cirebon royal family until today. Mega mendung is just one of the more than 300 batik motifs Cirebon has nowadays. Other Cirebon batik motifs include the piring selampat, the kapal kandas, and the bunga terompet (allamanda). Walk along Jl. Buyut Trusmi, situated behind Jl. Trusmi Kulon, to see more stores and some houses where the local batik craftsmen are painting the batik fabrics. In these houses, you can also buy batik fabrics and learn batik-painting directly from the masters. Batik artist Katura A.R. is one of these masters who has opened his house for travelers curious about the batik art. 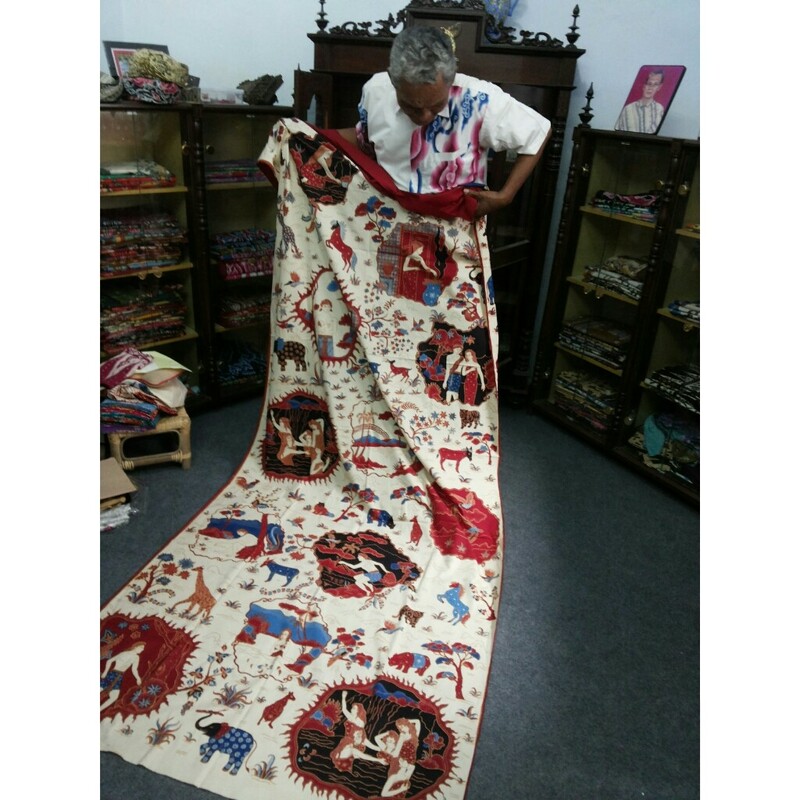 In his home, you can see craftsmen busy creating the batik fabrics, from sketching the patters, cutting the fabrics, drawing and coloring the designs, to cleaning and air-drying the final products. Unfortunetly, I had no time to learn making batik in Trusmi. The whole process usually takes two months. However, according to Katura, the process can be significantly shortened to only two hours by using a small handkerchief for travelers who wish to create their own batik fabric. Any travelers wishing to do this will have to make an appointment at least one month before his or her visit to Katura’s house. He said that some foreign travelers have actually opted to stay here for months to really learn about the whole batik-creating process. Jl. Trusmi Kulon, Plered, Cirebon, West Java. Jl. Buyut Trusmi No. 5, Plered, Cirebon, West Java. This entry was posted on August 1, 2013 by Edna Tarigan in Indonesia, Travel and tagged Batik, Cirebon, Indonesia, Plered, Textile, West Java.